A recent story over at Ars Technica has reminded me that there can be more to a copyright lawsuit than just copyright. Ars reports that a movie studio has filed suit to get Armageddon 2419 A.D, the original Buck Rogers story, declared as public domain. The studio wants to make a movie based on the story and is unable or unwilling to come to terms with the author's estate. 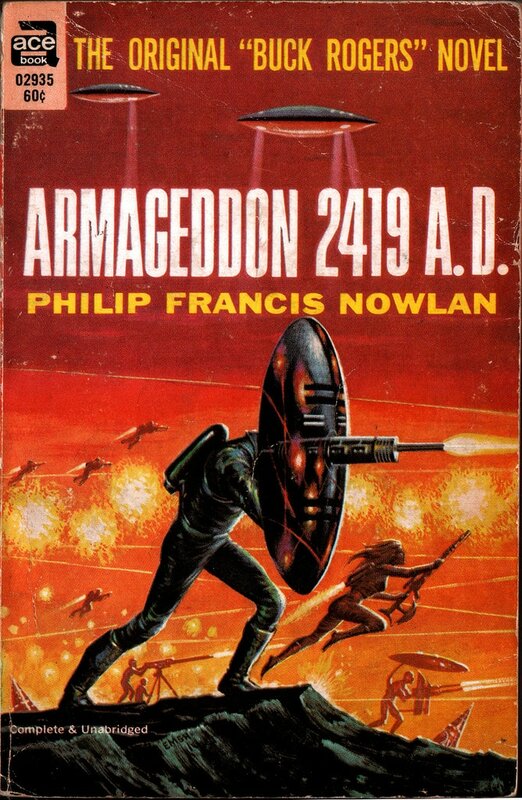 The story was written in 1928 by science fiction author Philip Francis Nowlan. The author died in 1940, leaving his rights to be managed by various entities. Currently, that is Dille Family Trust. That group (or its predecessor) has been managing the rights for the past decades, including licensing the Buck Rogers name for a short-lived tv series in the late 1970s. Since you can find that novella on Project Gutenberg and since there is no evidence that the copyright was renewed in 1956, the studio has a slam dunk case. The work is in the public domain, so the studio can move forward and make that movie, right? Not necessarily. The studio will win this lawsuit but there is still the issue of trademarks. The estate owns trademarks over the name Buck Rogers, as well as other elements from the authors works, and that could be the deciding factor on this licensing issue. We're going to have to watch and see how this plays out in court and in the conference room, but I think what we might have here is another example of a trademark trumping the public domain status of a published work. If you're like me, you're probably thinking that trademark has nothing to do with books. That's copyright, which is an entirely different part of IP law. Yes it is, and no it's not. It may help in looking at this situation to understand what is a trademark. Think of a name like "Halo". That's a trademark owned by Microsoft for its popular video game series. Because they've registered the mark they always write it as "Halo®". What that mark means, to the owner of the mark, is actually "[Text string that represents my video game franchise]". So Microsoft can't, for example, write a slogan like "There's a Halo® around this game" because what that says when Microsoft writes it is "There's a [text string that represents my video game franchise] around this game". To Microsoft, in the context of video games, "Halo" means only one thing: its games. Can a trademark on a work trump the copyright status of said work? I ask this because we keep running into lawsuits over licensing public domain works that hinge on trademark and not copyright. For example, the estate of Edgar Rice Burroughs maintains its control of the Barsoom stories on the basis of the trademarks on elements used in the original stories ( trademarks which I had previously erred and described as bogus). Similarly, the Buck Rogers lawsuit is going to eventually turn on the status of the trademarks on details in the story. But that is beyond the scope of this post; I am leaving this for the lawyers argue over. Speaking of lawsuits, that brings me to Sherlock Holmes. As I have previously reported, earlier this year the Conan Doyle estate sued Miramax, Penguin Random House, and Mitch Cullin over Cullin's book, A Slight Trick of The Mind, and the movie based on it. That movie, Mr Holmes, starred Ian McKellen and hit theaters in July. The estate had a weak copyright claim and a questionable trademark claim. I would have loved to have seen this point argued in court, but alas movie studio settled with the estate. I can understand why Miramax settled; it was cheaper than fighting the case in court. And that is a shame because the trademark claim would likely have been shot down had the case gone to court. Since to Microsoft the term "Halo" used in the context of video games means only its games, if anyone else uses the term "Halo" and isn't talking about Microsoft's game, Microsoft has to take steps to stop them from doing that. So if Sony launches a game about angels and calls it "Halo" then Microsoft has to sue Sony to make sure that consumers know that the word "Halo" means Microsoft's game and nothing else. That's an obligation under trademark law, and if Microsoft doesn't bring that suit then it risks having a court someday declare that it no longer has the right to have the term "Halo" used for only its games. There are a couple relevant facts about the Sherlock Holmes trademarks. The first is that the estate doesn't own all the trademarks (seriously). The second is that the estate hasn't been visibly defending the trademarks. For example, when the estate was sued several years ago over the copyright status of the Sherlock Holmes character, it should have defended its rights by filing an immediate counter suit over the trademark. I can't find any sign that this occurred; instead, the Conan Doyle estate fought the copyright case all the way to the Supreme Court, and lost. Similarly, the excess of Sherlock Holmes fanfic available suggests that the estate has not been defending its trademark. If the most recent Sherlock Holmes lawsuit had gone to court, I would put money on the trademark being ruled invalid. My reasoning is simple: the estate wasn't defending the trademark, so it was no longer valid. And my justification was even simpler: allowing the trademark to block the reuse of a public domain work effectively extends the copyright in perpetuity. But again, that's a matter for lawyers to argue over. Given that there is a lot of money involved, this is a point that will eventually be settled in court, and I'd bet that it will make its way to the Supreme Court before it's done. France has life plus seventy copyright terms. What possible reason would they need for a longer term? I guess you know about “Le Petit Prince”, right ? The “de Saint Exupery ” estate is our own Disney. I’d love to see a movie based on Armageddon. It’s really a very good bit of space opera. 2- The original story has been adapted in newer novels that are still in copyright. There might be a valid claim on the basis of the newer stories. A particularly interesting fact about the Buck Rogers newspaper serial is that the novel was licensed on the basis of the cover of the Amaxing Stories issue. Only problem is the cover was based on SKYLARK OF SPACE. Good point. I had assumed that there would be trademarks over the original work, but I could have been wrong. Things were different in the pulp era. Amazing Stories bought first world rights but that copyright might have been superceded by a later edition. I’d have to dig out my paperback copy to see what the ACE copyright listing looks like. But I do know that SKYLARK OF SPACE is both in and out of copyright because the magazine edition is in the PD but the novel was reissued with revised text in 1958. There are small but meaningful differences between the two versions. Should be interesting to see how this suit plays out. It really gets ridiculous when authors’ names get trademarked. Best example – also pulp era – is Robert E. Howard, the creator of Conan. Died in 1936, so his work is internationally public domain. The Robert E Howard Properties Inc., part of Paradox Entertainment (the owner of the Conan properties, among others), trademarked the very name of the author. So you couldn’t even publish his lesser known stories with his name on the cover without consent (to be paid in bucks) of Paradox. I thought the US Supreme Court ruled 8-0 in Dastar Corp. v. Twentieth Century Fox Film Corp., 539 U.S. 23 (2003), that a trademark cannot be used as an ersatz copyright. Yes, but without knowing the specifics of the Buck Rogers trademarks we don’t know whether Dastar applies. And here’s a summary of the Dastar case, for those who are interested.